To help create a discussion about the issues of gun violence, we have to make it personal. Yet, it's a statistic that we have grown numb to hearing. To make people care again, we had to make gun violence personal. On October 1, 2015, a shooter killed 8 students and a teacher at Umpqua Community College in Oregon just one hour south of our own university. After the shooting, we felt like we had to act. We realized that through the course of so many national tragedies that have happened time and time again we had become numb to the statistics. We had to make the stats personal if we wanted people to get involved. We worked with Facebook to create personalized videos integrating a viewers own videos and tagged photos from their account. The videos were designed to feel uplifting and joyous, incorporating highlights from life and moments that give us feelings of nostalgia. Then, at the end of the experience the viewers hear a loud gun-shot as their screen cuts to black. In this, the viewer becomes the victim turning the issue of gun-violence into something personal. 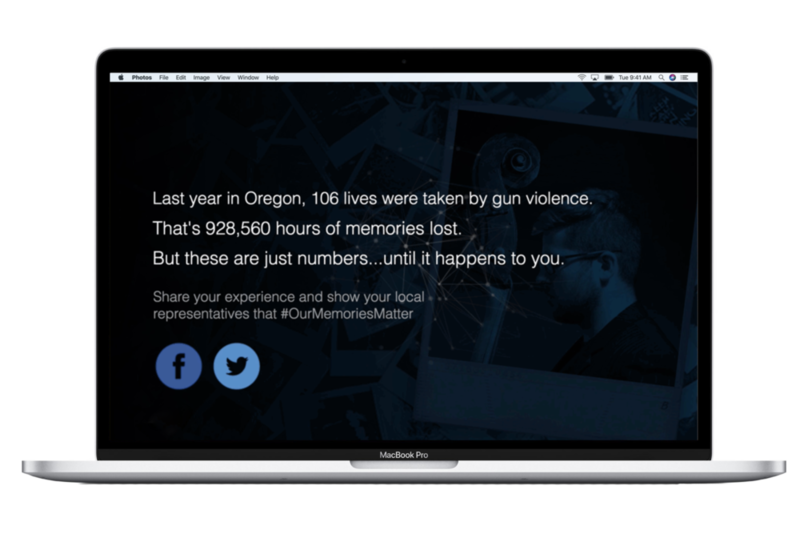 After the video, the viewer is shown localized gun-death statistics based on their geographic location as well as a call to action that encourages them to share on social media. Users that share via Twitter have their local government representatives automatically tagged in their tweets. Upon launch, nearly 260,000 people were reached and thousands of unique videos were created and shared. Since the videos pulled personal footage from the viewers own Facebook account, every video was unique to that person.